Chopped corn beef, accented with sauerkraut, caraway seeds, and Thousand Island dressing, wrapped in a crisp spring roll wrapper. A twist on a classic deli sandwich. 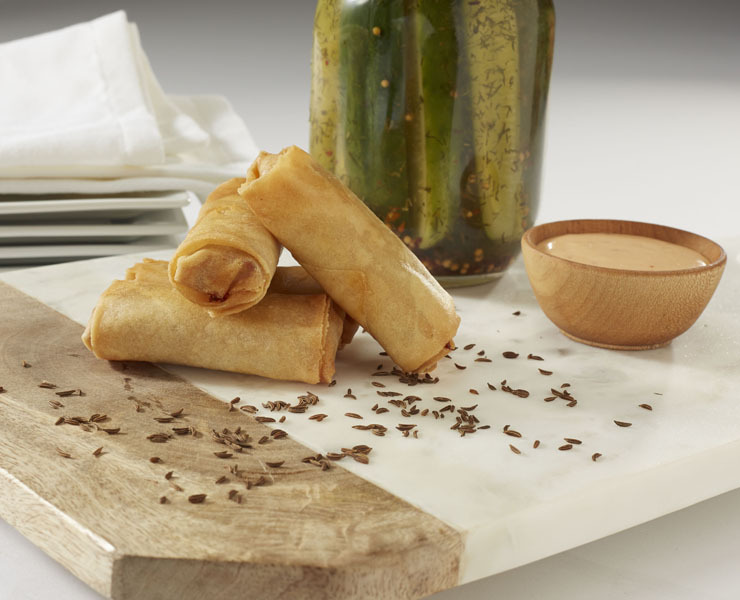 Kabobs’ Reuben Spring Roll provides the iconic flavor profile of a classic NY deli reuben sandwich, in a crisp spring roll wrapper. Perfect as-is or pair with Thousand Island dressing, or a accompaniment to a fresh coleslaw salad. Kabobs’ Reuben Spring Roll is ideal for any type of casual or formal event. From frozen deep fry at 350 ºF for 6 - 8 minutes or until Internal Temperature Reaches 165 ºF as measured by use of a thermometer. A buffalo style spicy combination of tender chicken breast, carrots and celery. Seasoned with hot sauce and a hint of garlic. All rolled in a crispy spring roll wrapper.